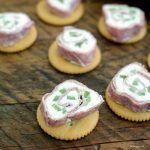 You gotta love a no bake no cook appetizer that is super easy to whip up, these Salami Rollups are just that! It’s that time of year when we need snacks! Lots and lots of snacks to get us through the game. If you’re planning to host a few friends for a football game this season, or a Bingo Night… or whatever…this easy appetizer is the best! Just three ingredients, you can totally make it ahead of time and it’s delicious! Salami Rollups are all around winners. We made a quick recipe video so you can see “the flip” in action! Go Sports! I made these for family and they were gone in minutes! Next time I’ll make a few more! Place a large piece of plastic wrap on your countertop. Place the cream cheese on top of the plastic wrap and cover with another piece of wrap. With a rolling pin roll the cream cheese out into an even layer. Replace the plastic wrap and carefully flip the salami and cheese so that the cream cheese is now on top. 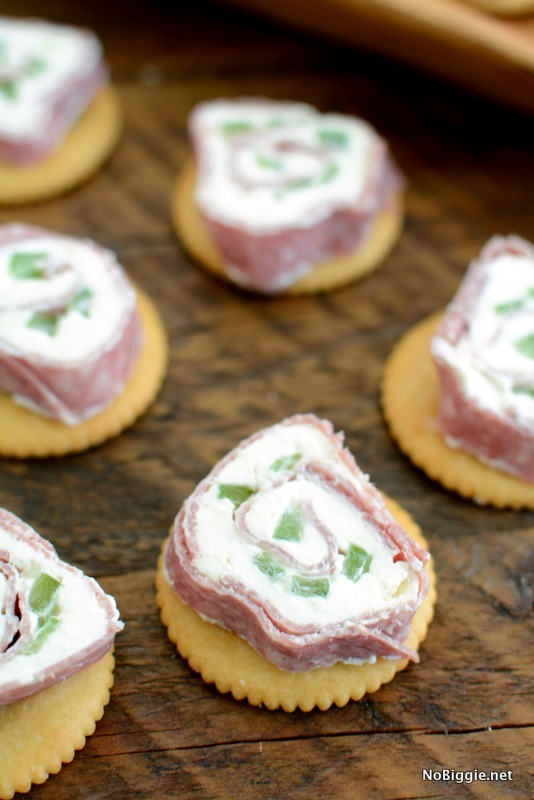 Remove the wrap and place the sliced green bell peppers over the cream cheese layer. Roll the salami over the cream cheese. Use the plastic wrap to help pull the roll tight as you work. Press the outer layers tight to hold it all together. When ready to serve, slice and enjoy each piece with a cracker! No cooking or baking involved! Now that’s a win win!